Aviation artist and historian Alice Eakle Marks perfected her hammerhead stall on an airline flight to Seattle several years ago. The incident never made the paper because Marks, a seasoned paper engineer, created the maneuver in paper for a custom-designed interactive greeting card. This card -- and a specially designed Air Mail Trail paper sculpture -- are among the aviation theme cards Alice Marks created. The hand-cut and folded Air Mail Trail card, featuring the a Boeing 40-B biplane descending from clouds to land, depicts an incident Marks remembers and which is described in a newspaper clipping. 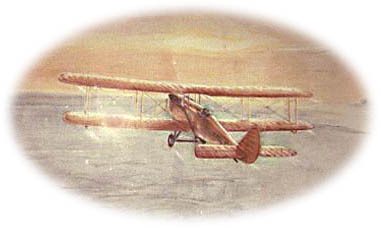 A Boeing 40-B biplane which carried contract mail for the U.S. Postal Service along the first air mail route across the U.S. often landed at the emergency air field in northern Illinois run by Marks' father (Paul Eakle). Marks has paper engineered cards for more than 40 years. 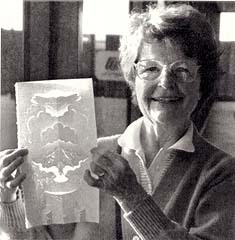 During most of that time, she specialized in aviation themes including the personal annual Christmas card for champion aerobatic pilot, Duane Cole, whose aerobatic books she also illustrated. Marks' career also includes being a teacher, printer, writer, and community activist. 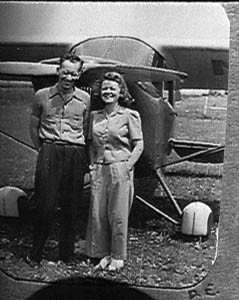 Alice Marks still lives by an airport outside of Rochelle, Illinois, with her husband, Henry, a former B-17 pilot and cropduster whom she met when he first learned to fly at the Waterman airport. 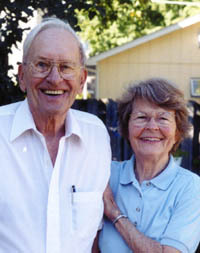 Their son, Mike, was killed in 1978 in a cropdusting accident in southern Idaho. The Marks Christmas card now always features a Stearman biplane sprinkling good wishes.